CW net on Thursday evening at 1930 UK local time, 7018 KHz in summer and 3538 KHz in winter. During the autumn, it is advisable to listen to both frequencies 40m at first and then 80m to see which has the better conditions. There are one or two members on the continent that find 80m impossible and there will be an informal listen-out for ROA members on 10.119 MHz 1530zand 1630z on Monday, Wednesday and Saturday. The original hut in use for the Lizard Wireless Station used the call sign LD, which were the original call letters of the station. These later became MLD and in 1909 GLD. The station closed its maritime service in 1913 and moved to St. Just near Lands End to become perhaps the most famous coast station in the world LandsEnd Radio GLD. 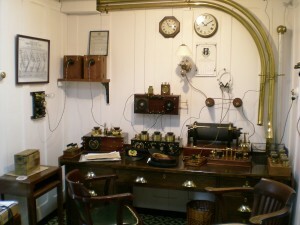 ROA members are welcome to visit the station and can try their hand on the morse key once again. Contacts have been made world wide from the web site and it is a great tourist attraction. QRZ is the newsletter of the ROARS and is published concurrently with QRZ and ROA Journal. It gives news about amateur radio affairs as they affect the former radio Officer. Articles about working QRP (low power), amateur direction finding and other interesting topics included. ROARS has its own club callsign of MX0ROA which has been registered since the new M call signs came into being on 1st January 2000. ROARS runs the amateur station at the Lizard Marconi Station with the callsign GB2LD. This is very fitting as the Lizard station is the oldest surviving operational Marconi station in the world. 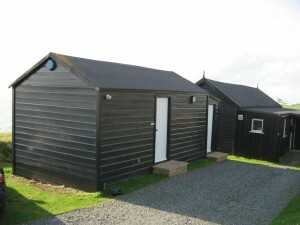 Marconi’s hut is to the left, the one on the right is the National Trust’s Wardens residence, what a fantastic view! Antenna in the foreground is an inverted ‘V’. 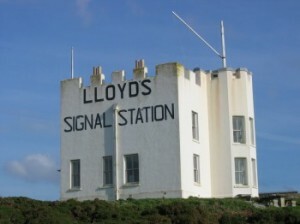 Lloyd’s signal station, before the advent of radio, messages were sent to vessels by the use of flags, whistles and lights. 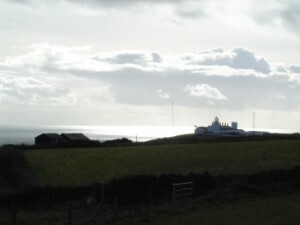 Lizard Lighthouse, the most southerly point in the United Kingdom, photograph shows Marconi’s Lizard Station hut to the left. From the end of 2011 it became clear that many amateur stations would be set up to mark the centenary of the Titanic disaster. Indeed I was approached in March 2011 to advise on setting up a GB special event station /MM on the mv. Balmoral and told them that permission would not be granted and that even getting on air would be difficult, advice that turned out to be accurate. 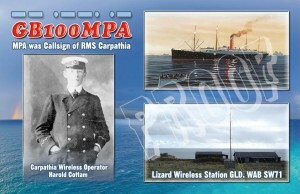 It seemed clear that stations would place emphasis on the Titanic call sign MGY, because of the important role of Harold Cottam on the Carpathia it was felt that more emphasis should be placed on MPA the call sign of the Carpathia. Application was made to Ofcom in the name of ROARS to obtain the call sign GB100MPA and this was approved. 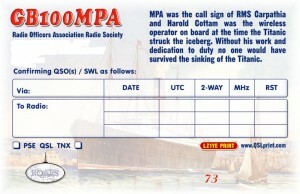 The call sign joined 62 other “Titanic” stations on air. ROARS secretary Geoff Valentine came to the Lizard for the centenary on 14th and 15th April. GB100MPA was very popular indeed and we had pile-ups to the extent that split frequency working was absolutely necessary. We had a huge problem before midnight when the output of the Kenwood TS-850s failed and we had to change rigs. We operated CW only as this was all that was available 100 years previously. 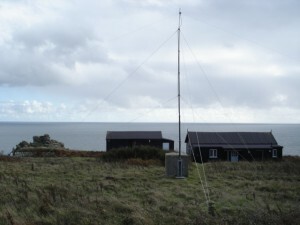 During the 28 days we had the call sign we made 1500 QSOs of which 150 were using SSB and most of these were on the day before International Marconi Day when 4 local amateurs took over the Lizard site and tested out their aerials using GB100MPA on behalf of ROARS. In a two hour stretch they made nearly 100 QSOs using SSB covering good DX stations. Since the Olympic torch left Lands End on May 29th until Friday 27th July when it arrived at the Olympic Park the amateur radio group “Worked All Britain” organised an event whereby they set up a station each day at the starting point of the torch. In all some 70 stations came on air and if an amateur station made contact with 10 stations it obtained a bronze award, with 20 a silver and with 30 contacts a gold award. The Radio Officers Association Radio Society (ROARS) activated its club call sign M0ROA and successfully contacted 40 of the special stations G4WAB with individual prefixes depending on the UK country in which they were operating. As such the GOLD award was obtained. I applied for an NOV (Notice of Variation to License) for the new 60m band from Ofcom, only to learn they have delegated this to the RSGB. I applied online and received the NOV in minutes! I have printed it out and keep it with the main license. It’s very useful as it gives details about the peculiar frequency arrangements. There are 11 little mini-bands within the band, and only one dedicated to CW, and only wide enough for a max of maybe a half dozen simultaneous QSOs. But it seems popular already, albeit maiinly as a rag-chew band. It’s very effective within the UK, especially from my QTH (southeast) to GM calls. Getting on air was easy for me, but may be more of a challenge for those with different antenna arrangements. I have a G5RV folded to an overall length of 60 feet. I match this to the 300 ohm ladder feeder with an MFJ 993B. It tunes nicely on all bands from 80m to 10m. It will even tune on top band if I s/c the ladder to form a kind of inverted L antenna. Joy of joys, the arrangement tunes sweetly on 60m as well! I’ve already had several QSOs on the band, so everything is ticking over well. I have also heard Mike/G0CHV on the band. Please give me a call if you hear me. I may be using G4AJY or MX0ROA.